↑ Plack, C. J. (2014). The Sense of Hearing. Psychology Press Ltd. ISBN 978-1848725157. ↑ Lopez-Poveda, Enrique A.; Palmer, A. R. (Alan R.); Meddis, Ray. (2010). 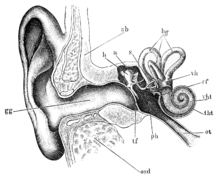 The neurophysiological bases of auditory perception. New York: Springer. ISBN 978-1-4419-5685-9. OCLC 471801201.